This project was created in partnership with The Home Depot. As always, the projects and ideas are mine! Want to make something fun and unique for your front porch or home this Christmas? 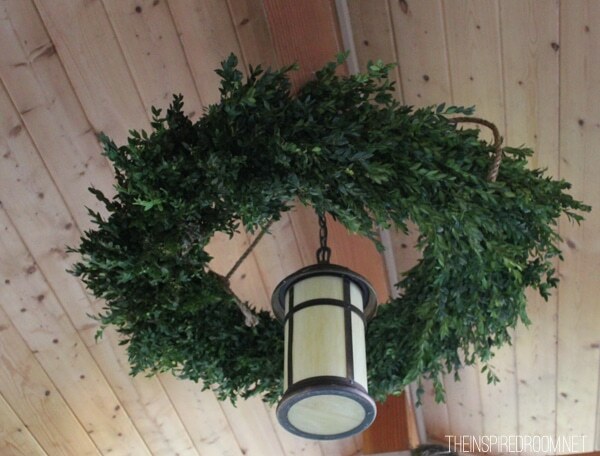 How about a festive boxwood wreath chandelier? You know you want one (or TWO). It’s pretty easy! And just wait until you see how it looks with the lights on, it’s magical! 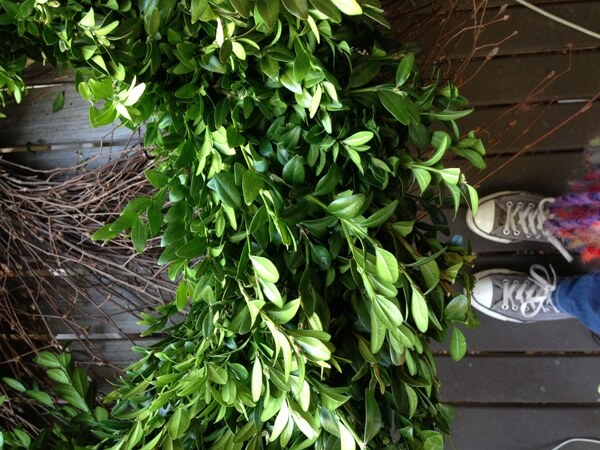 You’ll need two boxwood wreaths. Mine are Boxwood Wreaths 30 inch and 24 inch, both from The Home Depot. (I ordered mine online.) You can also make this with just one wreath, but we went with the BIG DRAMA and made ours a double-decker! Then you’ll want some rope or ribbon, or even a chain. 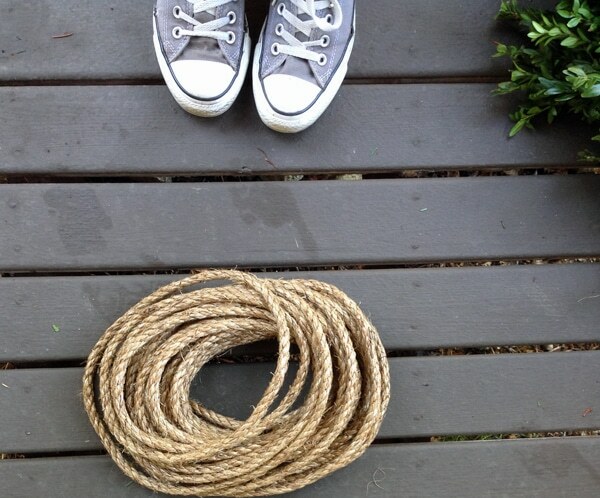 We chose some thicker rope like this so it would have a rustic nautical feel. I love it! Then you’ll want some hooks for hanging your wreath. 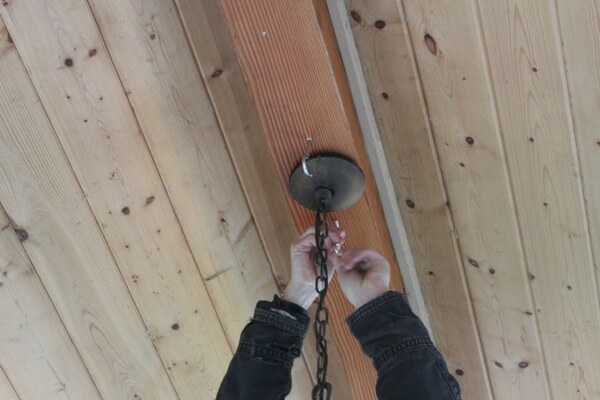 We installed heavy-duty hooks from The Home Depot that were big enough to handle our rope. Once you get the wreath hung, you can’t really see the hooks (at least on ours) so don’t worry about getting fancy hooks, unless you have a really snazzy porch or are using them inside (or if you think they will show). Next you’ll want to have your husband or friend get up on a ladder and hold the wreath so you can decide how low to hang it. 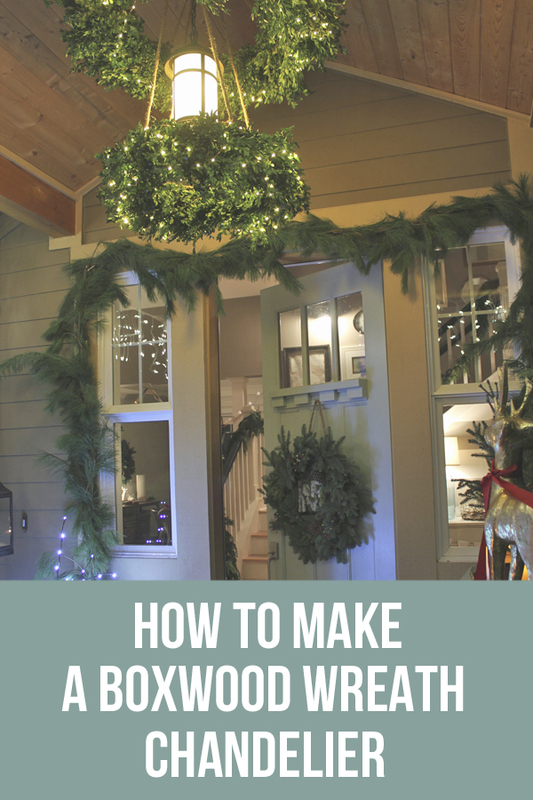 You do not need to have an existing light for this wreath project; it will look great even by itself. 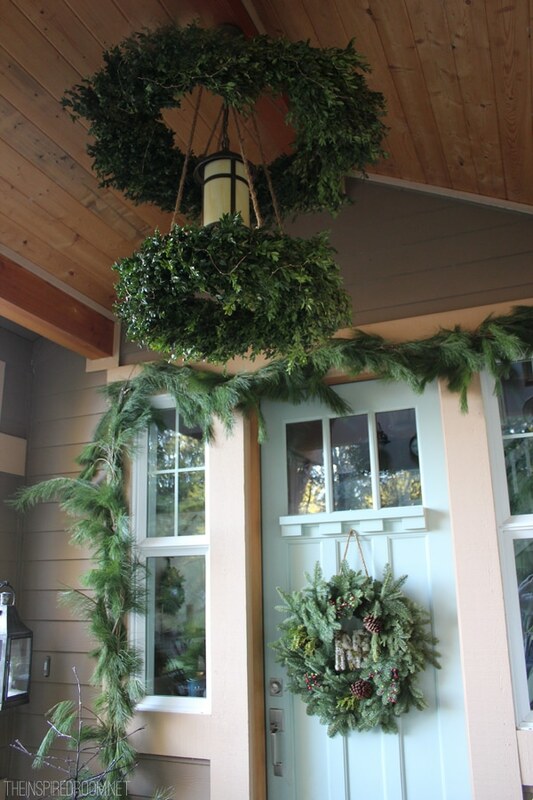 If you have a shorter porch ceiling, I would recommend just one wreath hung closer to the ceiling. We decided to hang the first wreath at the top of our lantern. Once you decide how low it will hang, you can judge how long to cut the rope. Before you cut, look ahead at the tutorial to see how we decided to hang ours so you can figure out how much rope you’ll need. Loop the rope around the wire on the back of the wreath and tie the rope in a knot to secure it. Then tie the other end of the same rope a few inches over, creating a “handle” you can hold. It’s helpful to leave a few inches of excess rope in case you decide you need more length. 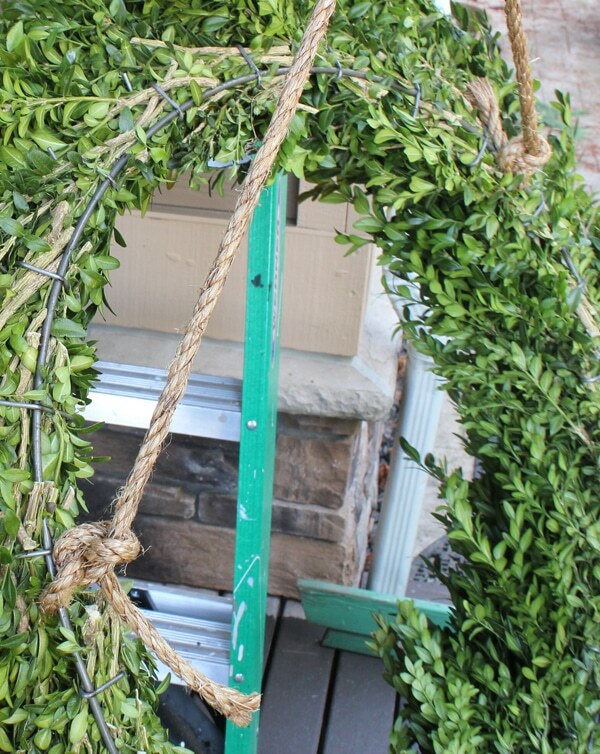 Note that your wreath will now hang lopsided, unless you repeat that step again with one more rope. 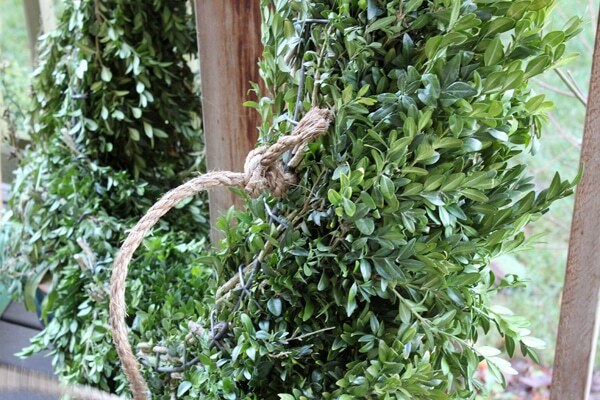 Take one more length of rope and knot it on the back of the wreath, opposite the other rope. 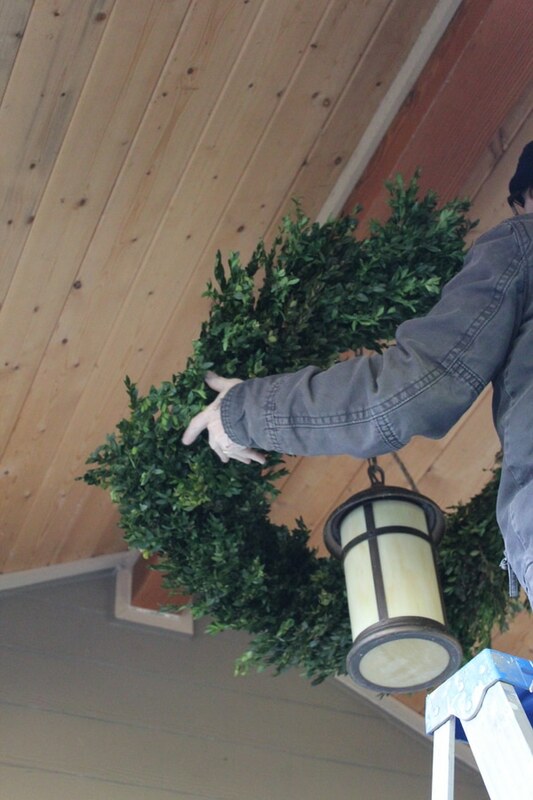 Then take the remaining end and knot it a few inches over, so your wreath will have two rope handles to hang it from (kind of like shopping bag or purse handles; see the photo below for how it will hang). Hang one handle on each hook, with the wreath upside down. Once you hang it, you can retie a rope or balance it out by sliding it around on the hooks a bit, as needed, to make it level. Once you are happy with your first wreath, pat yourself on the back and call it done. I loved the look of one. Or go for the drama like we did, and make another one! Repeat the process for your second wreath. Just make sure your rope is long enough to hang down through the first wreath. We looped both wreaths over the same hooks. When you like how the wreaths hang, trim any excess rope and you are done! If you want to add lights, I’d recommend slim wire battery-operated LED string lights with a timer. That way you can set them to come on and off every evening so you don’t have to climb up and deal with them every day! 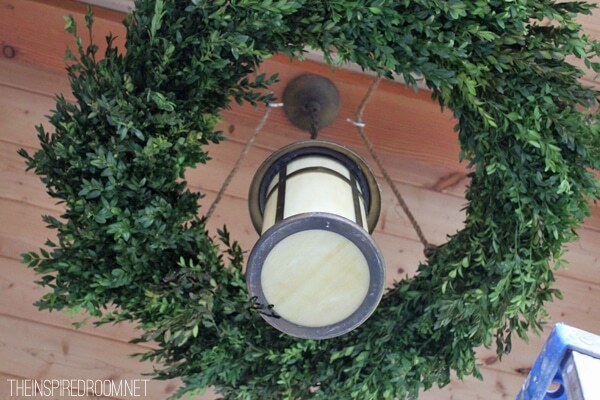 This was such a simple, fun project for our Christmas porch! I love what a bold statement it makes. It’s pretty all day long, and at night it’s absolutely magical! It makes my porch feel like you are entering a fairytale! I think this would be beautiful for a wedding or party, too! 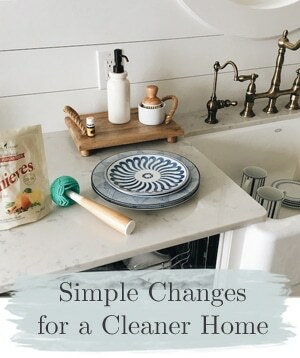 If you like this project, feel free to pin it on Pinterest or share it on Facebook and link back to this post! Come see the rest of the Christmas porch here, and the inside of my Christmas house here! You’ll need several sets of lights, depending on what size and how many wreaths you use. 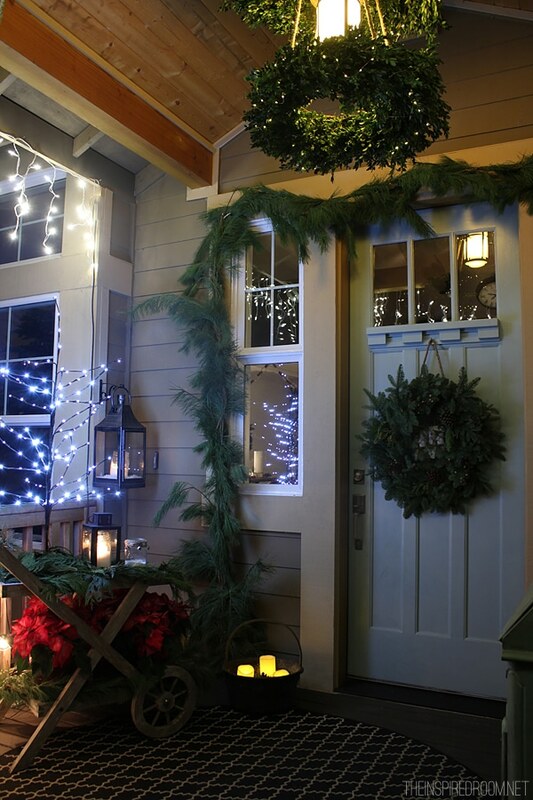 Do you decorate your porch or front door for Christmas? This is gorgeous! 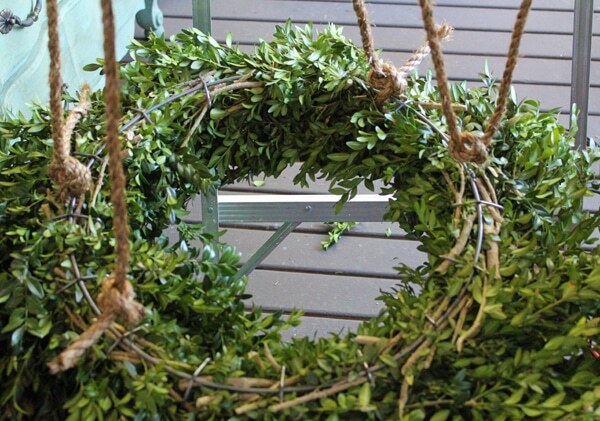 I love boxwood wreaths and what a creative way to use them! Love it! it looks amazing….Thanks so much for sharing it :-) I definitely HAVE TO plant some boxwoods in my garden next spring to start making those wreaths…. I saw this the other day and wondered how you attached the wreath. This is so clever and beautifully presented too. Great how-to photos. 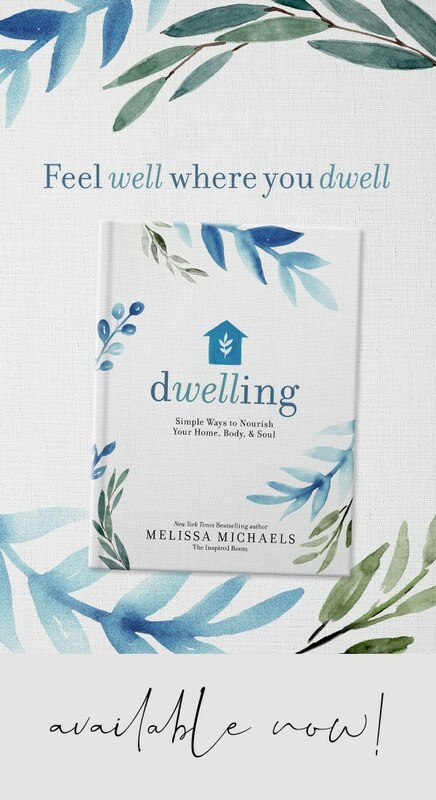 Melissa, great tutorial! I love how the wreaths look with the lights on. Thanks for sharing with us. Melissa, I am so sharing this with my husband. It would be great in our sunroom. Your entry is fantastic. 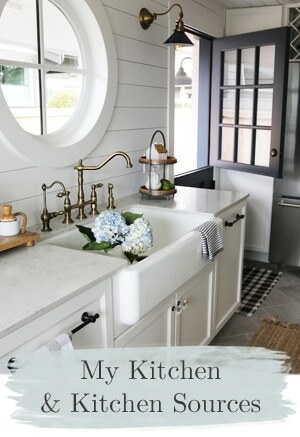 I posted day two of my holiday home tour. Please come by for a visit. This is my first post so I want to let you know I am very much inspired by your site! I appreciate your attention to cost and simplicity, yet your designs are creative and sophisticated. This holiday hanging wreath is wonderful. I thinks it ‘s so fun to get people to look up to admire beautiful decor. Ceilings are too often overlooked when designing rooms. Enhancing ceilings with more than normal lighting adds another layer and dimension to the space! 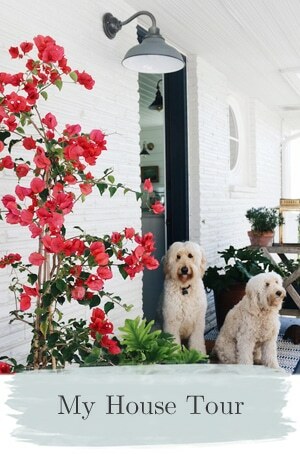 Your porch design says it all. Really lovely! Thanks so much. 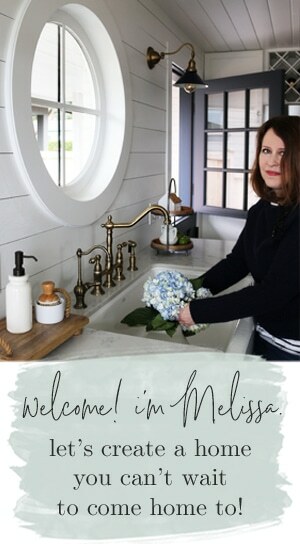 I’m also enjoying the virtual Holiday Home tour I found through your site. Super idea and so many creative women. 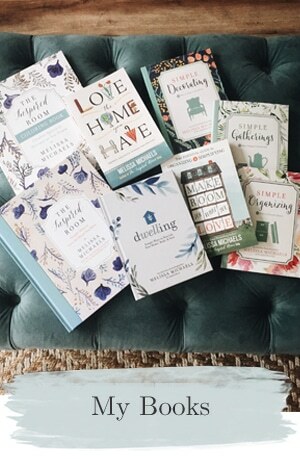 I am obsessed with boxwood! I absolutely love the stuff and this is one of the prettiest ideas I’ve seen yet. 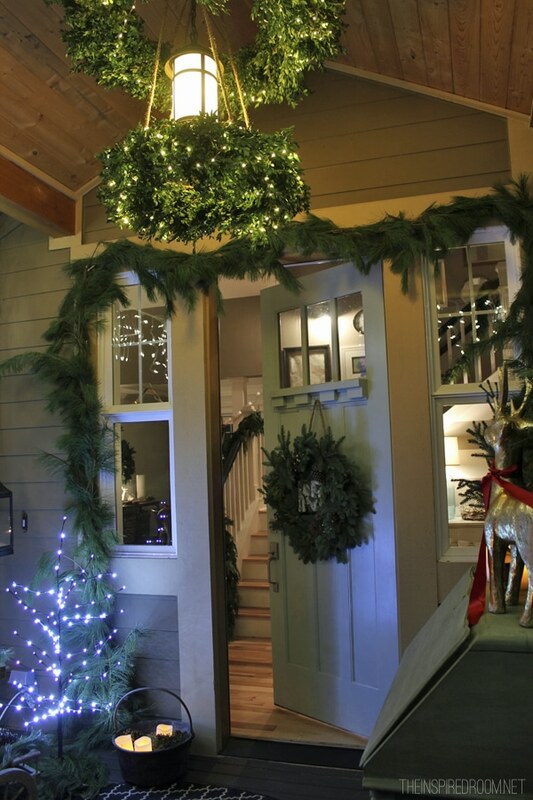 I don’t have a roof on my front porch but when I get one, this will be my first project for the holidays! I love it! Thanks so much for posting this. I love your blog too, by the way!! 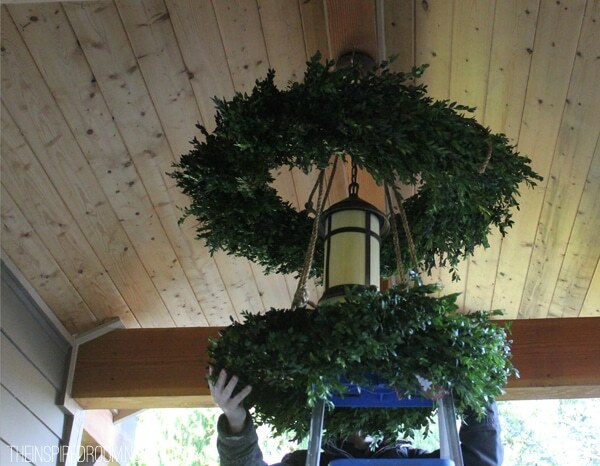 This boxwood chandelier is the most “genius” idea I have seen this season….Love it. I love your outside Christmas decor, that porch is stunning. And that double decker boxwood wreath is genius.